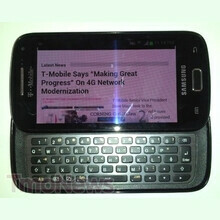 Remember that Samsung SGH-T699 Android smartphone, a photo of which surfaced on the web a few weeks ago? Evidence suggests that the handset will be known as the Samsung Galaxy S Blaze Q and that it is scheduled to launch next month. August 15 is when we can expect seeing the smartphone land on T-Mobile shelves, as revealed by this image obtained by TmoNews. Currently, we don't know a whole lot about the Galaxy S Blaze Q, yet it is most likely powered by a dual-core Snapdragon processor. The dimensions of its screen are unknown, but we seem to be looking at an AMOLED panel with a resolution of 720 by 1280 pixels. For those of you who are into video chats, the smartphone offers a front-facing camera, and the main shooter on its back is rumored to be of 5 megapixels. Not to be forgotten is the handset's full QWERTY hardware keyboard – a feature that we don't get to see that often anymore. And that pretty much sums it up for now. We might get more details as the smartphone's alleged date nears, so stay tuned if you are interested. Pricing is expected to be known once the Samsung Galaxy S Blaze Q is made official by T-Mobile. If this is the Blaze which is apart of thr Galaxy S1 line up, I doubt it'll come with a 720p display. The screen appears only 4 inches so we are most likely looking at 480 by 800. It might have the S4 processor but again i wouldn't be surprised if it only was S3. However you agent getting this phone for the most high end specs. No you want a great and roomy slide out keyboard. More than likely it'll be a rebranded Samsung Captivate Glide. With minor upgrades if any. The Glide wasn't a bad phone though just overshadowed by Skys**ts and iPhones. Its not a rebranded Captivate Glide but you aren't too far off tho. The Glide only had a 4 row keyboard and the keys looked more flat than this one. Also this one tho minor, has a psychical home button. I was going to say it'll probably share most of it's parts with the Glide like the camera,display, etc. However even the Glide has an 8 megapixel camera. What is up with T-Mobile releasing Samsung devices with such low resolution? Its actually Samsung to blame, believe it or not. Samsung labels certain devices as Galaxy S devices thus they will have only super amoled(not plus) 480 by 800 displays. They have never used qHD displays before. They moved all the way up to 720p. The Glide and SGS2 came out roughly the same time when Samsung was still using Plus displays but they only gave the Glide the pentile Super Amoled display because it was labled as just an Galaxy S device. Thankfully they didn't also slack off with the actual specs. Having a dual core processor with 1GB of RAM was very welcomed. But yea I can see them doing the same thing with this device. I just hope its got a 99 dollar price tag on it. That's the problem with a lot of the mid range phones being priced too closely to the flag ship devices. Sigh maybe they don't want to make anything reAlly good in case it takes away sales from the S3 or Note 2. Is it just me or the name sounds too ridiculous? I'm interested in seeing the official specs for this phone. If it is any good, I may upgrade from my Desire Z.